I have been going through a burger phase, which all started as a result of tasting a home made steak burger recently. Since then, all I have been thinking about is, what burgers I could make. However, this time, a quick bite on a Sunday night brought me to Bonarche’s Gigantic Butchers Burger, comprising of tender grilled MSA porterhouse steak, fried onion, egg, bacon, melted cheese, aioli, beetroot, salad & Smokey BBQ sauce! Not bad at all! 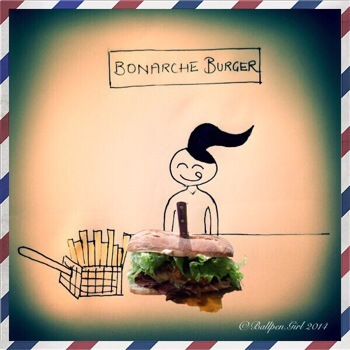 This entry was posted in Food and tagged Bonarche Burgers, food, steak. burger. Bookmark the permalink. ← I think it’s dead?? ?